And of the people is he who sells himself, seeking means to the approval of Allah . And Allah is kind to servants. I admire such people and wish to be one of them one day in shaa Allah. They trade their soul in exchange of Jannah. What a profitable business deal they make! Allah’s pleasure is all that they seek. They don’t have to weigh the apparent benefits of Dunya – whom to please and whom to leave. What a sense of satisfaction, working for the One Who not only acknowledges but returns it in multi folds. And thus in a world where we have complaints about how misunderstood we feel, Allah is Ar-Ra’oof. He knows. He understands. He’s the one who blesses His real servants with sakeenah (tranquility) and assures them of His truthful promise. For what they are giving up means NOTHING to what’s waiting for them ahead. And when I long to be among those beautiful people after reading this verse, I’m guided towards the next step. O you who have believed, enter into Islam completely and do not follow the footsteps of Satan. Indeed, he is to you a clear enemy. It’s amazing how badly we all long for Jannah and how we dream of it yet we don’t seek the right recipe to taste its sweetness. That recipe is right here. 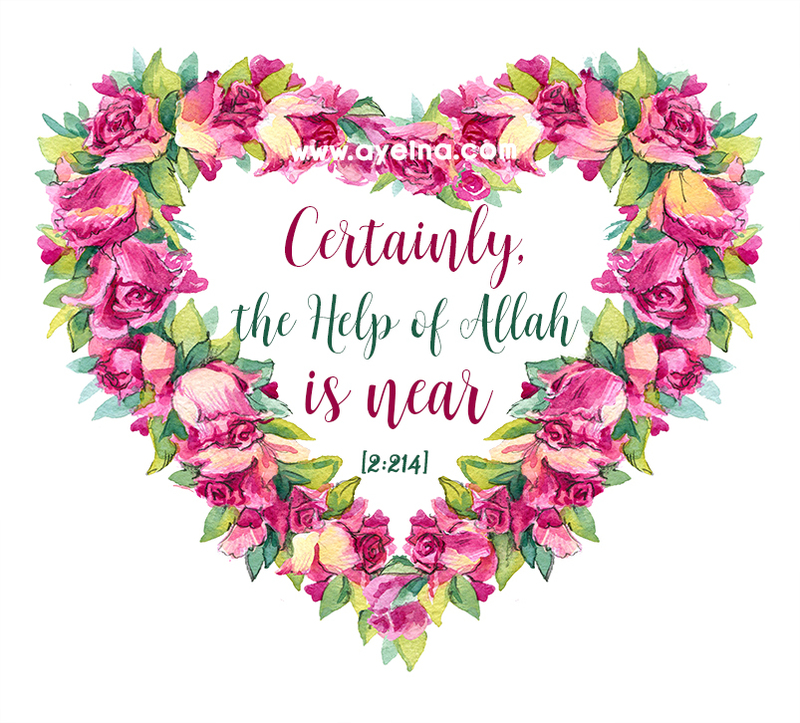 Allah wants us to enter the silm – the security, the peace – His deen, without wobbling and being inconsistent, without losing focus so we can have a purposeful life with a sound heart. It’s the only path that can give me physical, mental, spiritual and emotional security. We all claim to love Allah s.w.t. but very few of us know what it means. His Love requires submission and a true love is fully committed. Allah wants us to be pure, live pure and spread pure. O Allah! I surrender! I give in, I give myself to You alone! I give up my views and actions that were against Your message. I give up my eyes from seeing what’s not decent. I give up my ears from listening to what’s not my business! I give up my stomach from excessive eating. I give up my tongue from harming others. I give up my heart from running after the fakeness of this world. This verse shows the inevitability of trials and tribulations on us as Muslims. Everyone experiences difficulty. Everyone experiences trials and tribulations but the believer will be raised and he will receive great rewards because of his patience and trust in the decree of Allah. Whenever things don’t go the way I plan, I always remember this verse and reflect. The Prophets and the pious predecessors all underwent trials. Allah tested the people with the highest of eeman even, so how can I say I believe and not expect to be tested? What a beautiful connection among all these verses alhamdulillah. If you submit completely and trade your soul in exchange of Jannah, then you will be tested! Sometimes when we think of all the trials Muslims are facing in the world, we wonder where is Allah. The sad irony is that we Muslims as well essentially believe in the exact same thing. Indeed, a true God would create a perfect world, and it’s called Jannah. These people want to be given Jannah without any effort. They believe they have essentially ‘earned’ Jannah merely by their existence (and of course even their existence was not even of their own doing). We, on the other hand, believe the pain and suffering and evil that exists in this world is all meant to extract from us the potential to counter that pain with mercy, to counter that suffering with compassion and patience, and to counter that evil with good. Each opportunity, if approached with faith, becomes an opportunity of good, and any pain or suffering diminishes when compared to the good that comes out of it. And in the end, the greatest of all good, which is Paradise, is contingent on our responses to these trials of this world. What a powerful read! This line: “People who reject religion and God often do so because they cannot understand the existence of pain and suffering in this world.” really struck me. It brings home our need to accept Allah’s decree, and know that what may seem like a trial is a blessing in disguise for a believer. Jazakallah khair for this post! I love the definition by Yadira Qadhi. It was easy for me to understand and relate to. Thank you for sharing sister.